We come now to the Queen of the sheet cake to be filled: the SPONGE CAKE, that we used in our Mocha cake. 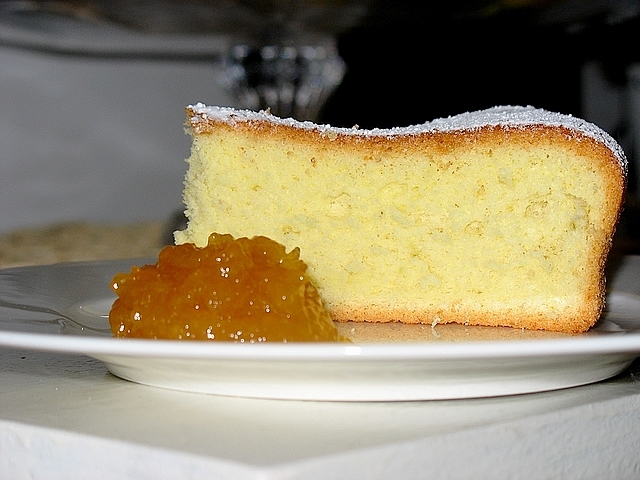 Despite the name, the cake has a very Italian origin, or rather genovese, due to the Chef Paul Cabona who prepared him while he was in Spain in 1700 in tow of his Lord. The cake was prepared for a banquet and was called pan of Spain to honor the Spanish Court. In this recipe, which is that of Maurice Santin, long egg whites and yolks are mounted together: I find that it is better and it's also easier to prepare. If you want, though, You can also follow the traditional recipe that it plans to mount before the egg yolks with the sugar and then the egg whites until they are puffed and shiny and incorporate the latter plan to the yolks, and then, at the end, Add the sifted flour, slowly stirring with a spatula. Preheat the oven at 180 degrees. In a very large bowl working the eggs with the sugar and the grated lemon peel until triple in volume the mixture, that will become white and fluffy. The ideal is to work it in a food processor, but you can also use an electric mixer, working the mixture at least 15 minutes. Finally, add the flour, stirring gently from top to bottom. Pour the mixture into a mold, preferably a hinge, well greased and floured butter. Bake at 180 degrees for 25 minutes. Worth try toothpicks, must get out from the cake dry. Then cool on a wire rack and use it as you like. Hello Silvia, It depends on how high you want it. I use these doses for a 20-cm dish when I want it cut into three parts, by 24 cm if the cut in half and even lie in the baking pan 60 cm if I do a roll. It depends on what you need. Hi Ada, a question: the egg whites should not be in the snow?